The European Space Agency is sending a rover to Mars next year, and they’ve just decided on a name for it. The upcoming rover will be called Rosalind Franklin, after the chemist whose work was used to determine the structure of DNA. The upcoming rover is part of the ESA’s ExoMars program, designed to study if life ever existed or currently exists on Mars. The program initially launched an orbiting spacecraft to Mars in 2016 called the Trace Gas Orbiter which sits in orbit and looks for signs of certain chemicals like methane that could indicate life on the red planet. 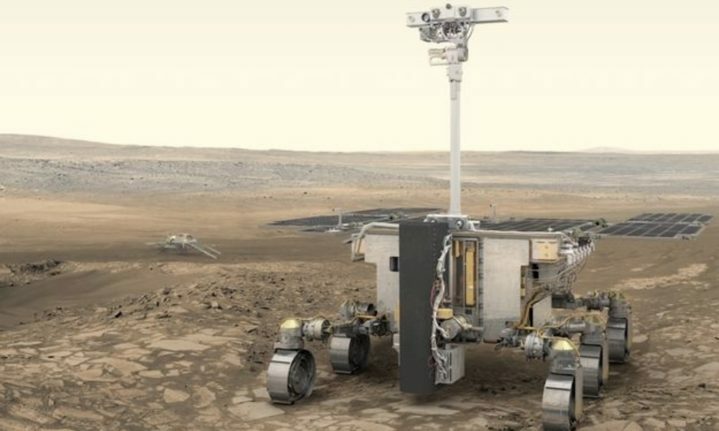 The Rosalind Franklin rover will head to Mars in 2020 with a similar mission, equipped with a drill that will reach several feet below the surface, sample the soils underground, and analyze them to try and find traces of past or present life. It’s somewhat poetic, then, that a rover dedicated to finding life would be named after someone whose research was used to learn about the blueprint of life. In 1953, Franklin used the then-new field of x-ray crystallography to image crystals of DNA. By shooting X-rays at a DNA crystal and measuring the resulting image, Franklin produced some key data that let researchers James Watson and Francis Crick discover the shape of the molecule. For this work, Crick and Watson were awarded a Nobel Prize in 1962, along with Franklin’s colleague Maurice Wilkins. Franklin herself was excluded, even though her work was key to the discovery. Although it’s sometimes reported that she was passed over for the prize due to her gender, there is another explanation; the Nobel rules prohibit posthumous awards, and Franklin’s career was cut short by ovarian cancer four years earlier in 1958. Like a lot of early radiation and X-ray pioneers, Franklin developed tumors thanks to her constant high-intensity exposure. She died in 1958, at the age of 37. Her death was a tragedy not only for her and her family, but for the entire world, having been deprived of decades of additional discoveries. Rosalind Franklin contributed a lot more to science, in particular discovering the structure of several viruses. It’s this work that is inscribed on her tombstone, and her contributions to this field dramatically advanced medical science. Unfortunately, Franklin’s career was cut short by ovarian cancer. Like a lot of early radiation and X-ray pioneers, she developed tumors thanks to her constant high-intensity exposure. She died in 1958, at the age of 37. Her death was a tragedy not only for her and her family, but for the entire world, having been deprived of decades of additional discoveries. With this new ESA rover, Rosalind Franklin will finally get to perform scientific research again, at least in spirit.